To continue with the fruity theme started in last week’s Summer Pleasures, I will turn my attention to a more tropical species. For some weeks now, pineapples, which are native to South America, have piqued my interest. The initial fascination was triggered by a wonderful course taught at the Ashmolean Museum, Oxford by Dr Jim Harris, titled ‘Eloquent Objects‘. One of the objects used in this course was a ceramic bowl with a pineapple motif; while the bowl itself was rather unremarkable, the stories it evoked about class, status, and colonial encounters were poignant. From that point on, I started seeing pineapples everywhere – on interior columns of the Natural History Museum in Oxford, on top of St Paul’s Cathedral in London, as ornamentations on various museum objects and on shelves of many gift shops. Not surprisingly the exotic Ananas comosus also crops up in several photographs in the Catalogue Raisonné. The most obvious and well-known is of course Plate XXIV. ‘A Fruit Piece’ in The Pencil of Nature. The star of this still life is really quite obviously the pineapple, centred in the frame and kept company by a quantity of apples (and what looks like a peach in the basket on the right). 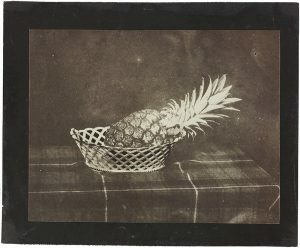 Indeed, the same pineapple is photographed on its own in Schaaf number 1503 arranged in a different basket but on the same table with a tartan table cloth. We know little about the time these photographs were taken apart from it being before 23 April 1846 when the sixth fascicle of The Pencil of Nature was issued. Searching the Talbot correspondence yielded no clues but it is a reasonable guess that the photograph would have been arranged in late summer when the fruit were most likely to be in season. 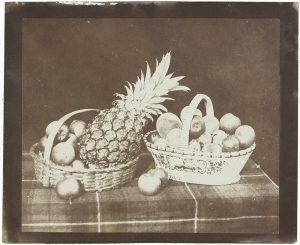 By the turn of the century, cultivation of pineapples in the UK became unprofitable as transportation of pineapples from the Caribbean became easier and pineapples increasingly common. However, the visual legacy of the ‘pineapple craze’ of previous centuries lives on around us. By the time the last fascicle of The Pencil of Nature was issued, the pineapple had already found its way into the seminal volume in the form of a vase in Plate III. 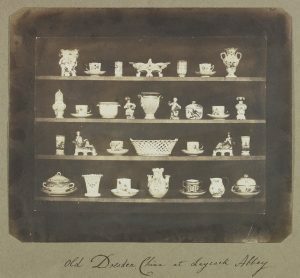 “Articles of China.” or as described by Lady Elisabeth Feilding on the album page below, ‘Old Dresden China at Laycock Abbey’. This same vase has also found its way onto paper in an arrangement with the Bust of Venus in Schaaf 2357 and other pieces of Dresden China captured in 1840 in Schaaf 2351 and Schaaf 237. The fact that there was a vase with a pineapple motif in Lacock Abbey speaks to the many other pieces of ceramics found in museums, galleries and auction houses across the world. 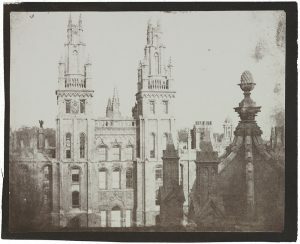 I finish here in Oxford, where the Pineapple on the gate tower of All Souls College foregrounds the view towards the Twin Towers of Hawksmoor. The pineapple is still there to be seen by many thousands of visitors to Oxford although I suspect that few notice it. Indeed, it is more difficult when one does not have the privilege of photographing out of the Radcliffe Camera, as Talbot did on this occasion. Nicholas Hawksmoor’s use of a stone pineapple to top the dome built in the early 18th century speaks to the practices of his mentor, Sir Christopher Wren, who famously adorned St Paul’s Cathedral and St John the Evangelist Church in London with pineapples. 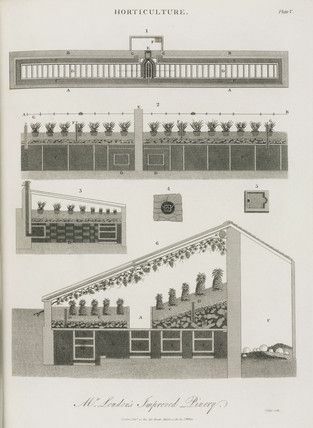 Wren was of course the architect of many buildings that were photographed by Talbot but I have not found other pineapples in our catalogue yet. I suspect searching for them might become a new hobby. The distinctive look of the pineapple along with its history as an exotic and highly prestigious fruit firmly established its place in the European visual aesthetic. 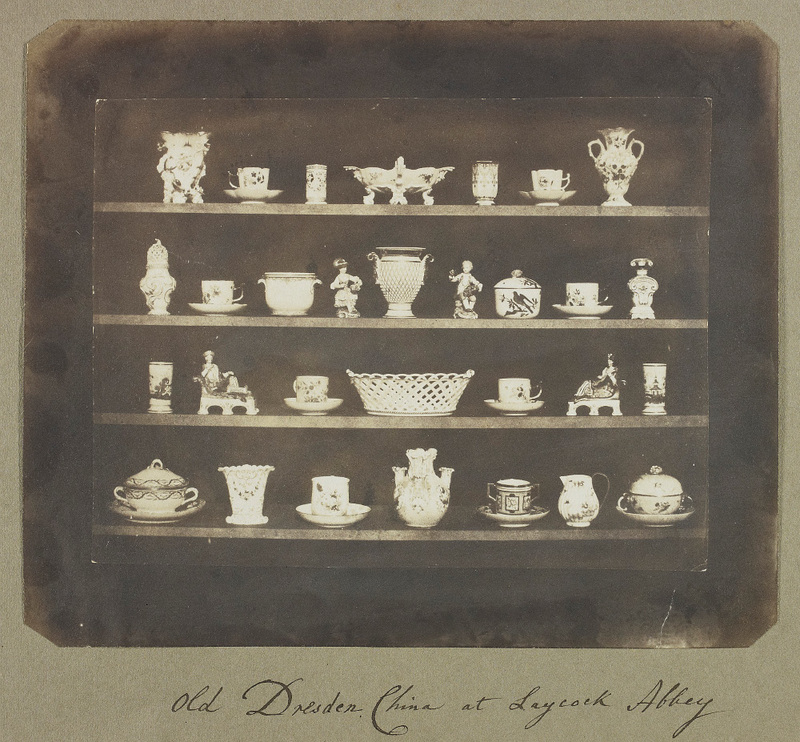 The invention of photography and subsequent proliferation of images of existing objects only went on to solidify it. 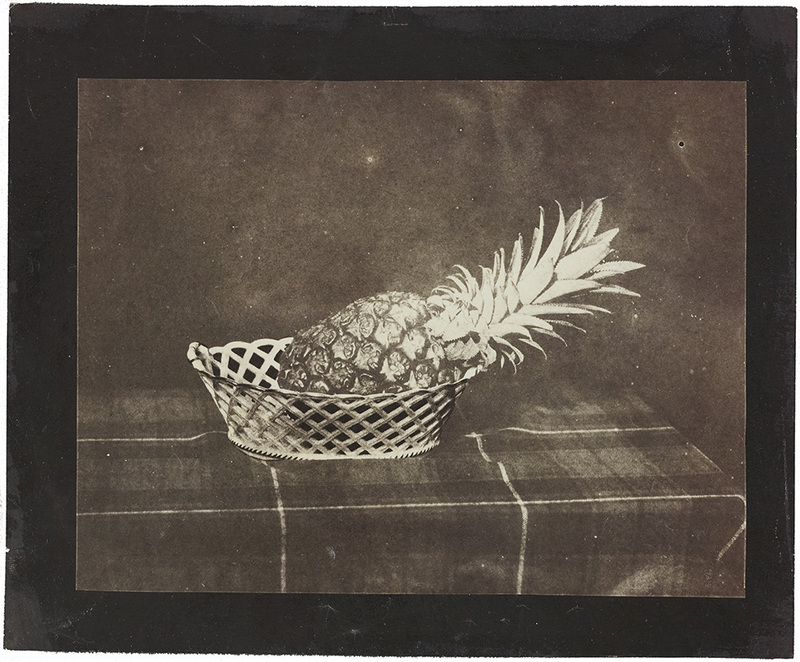 Today the once elusive pineapple is so abundant that it is easy to forget that in Talbot’s time it still retained an air of significance both in art and science which made it a perfect subject for capture.